Nikon's 78mm Fieldscope rated highly with our judges for sturdy, intelligent construction. You'll never fumble for the focus ring. Nearly as broad as your hand, it extends all the way around the scope. It turns smoothly and offers just-right resistance. However, there is no sighting device or built-in sunshade, and the scope is not waterproof. 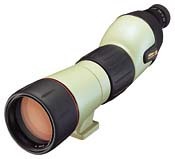 Birders who wear glasses may find the eye relief of the 25-56x zoom not quite sufficient, so it's a good idea to try it before you buy it. The scope comes in angled as well as the straight-through version we tested. Both models use Nikon's ED (Extra-low Dispersion) glass. Eyepieces are sold separately. When we tested the Fieldscope's optical resolution, using the 25-75x zoom eyepiece Nikon sent us, we dialed the magnification back to 60x in order to compare the scope to those with 20-60x zooms. The Fieldscope won the same outstanding score of 19 at 60x as the Swarovski ATS80 HD and Leica APO-Televid 77. Interestingly, increasing the Fieldscope zoom's magnification from 60x to 75x did not improve its score. The Nikon Fieldscope reviewed here is not waterproof, and therefore we can't recommend it. There are too many good waterproof scopes available. Furthermore, it lacks the superb engineering of its smaller sibling (the Nikon 60mm ED). Nikon has brought out, in 2003, a new, waterproof full-sized Fieldscope. We expect to have it in for review soon.